Serenity Now Travel Blog: Day 5- Snorkeling with Gimpy. Today was our first day totally free. We decided despite the injury we were still going to spend the day beach-hopping to check out some snorkeling spots I had read about here, but we started our morning with opening our Anniversary gifts which we didn't get to do yesterday. I'm going to the MLB All-Star game at Citi Field!! My jet lag is getting better- I woke up at 5:30am. We decided to head up to the North Shore and work our way back down to Aulani. We left at just around 9am. We still didn't have our rented wheelchair- it was arriving at the resort some time around noon. We did have Aulani's borrowed wheelchair, but it's a standard wheelchair so I did not want to be lifting that thing into the trunk of our rental car. So we continued with our regular routine, I go get the car and pick Matt up at the lobby. We headed out to the North Shore at just after 9am. We didn't hit any type of traffic on the drive, although we did have a small hiccup when trying to get gas for the first time in our rental car. It wasn't a big deal, just couldn't figure out for the life of us where the gas tank door release button was. Turns out, there isn't one. Ha! We are in a Chrysler 200 convertible. We were going to go with the Mustang, but the guy at Enterprise said he would go with the Chrysler since it is much more comfortable and has more luggage space. Thank God we listened, because now we have a wheelchair in addition to our luggage. We arrived at our first stop, Shark's Cove (Pupukea Beach Park), at just after 10am because of the gas stop. Parking was pretty full, but we found a space pretty quick. Now What I didn't remember reading about was how difficult this place is to walk to from the parking lot. We found this a lot today. I should have taken pictures of the "walkway". Basically, Matt spent most of the way down on his but, while I carried the backpack, snorkel gear and crutches. When we first got there and I saw the "path" I thought (and still think) there is no way Matt should have tried to get down there, but Matt was determined. So it probably took us about 15 minutes to get down there. We had one nice, older gentleman offer to help, but really there was no way to help Matt- didn't think to ask him to carry one of my heavy bags! This area is really cool, but bring swim shoes as it's rock everywhere! Matt got himself situated and we used this time to figure out our new beach routine. I'd walk with Matt to the water's edge carrying his snorkel mask and then once we got to the water, I'd take his crutches and he'd move himself into the water like a beached whale. It's quite the site. I didn't go in because the deep part had a lot of waves and I'm not good with waves, especially when you're surrounded by rock! The other part to the left, the tide pools, were really cool looking but I was way too intimidated to go try and explore it on my own. Not to mention I was a nervous wreck anytime Matt was in the water. I did not think this was a good idea at all. When the doctor told him he could swim, I'm pretty sure this is not the type of "swimming" he was meaning. I was a little more comfortable with the idea since there were so many people in there, that if he struggled they'd be able to help him. So I just took some pictures and a lot of video while waiting for Matt. We don't have any shots from snorkeling since Matt didn't want to have to worry about a camera as well as everything else he had going on. After about 30 minutes I was relieved to see Matt headed back to shore. He said it was amazing and he definitely would want to come back again. The climb back up was more difficult for Matt, he shouldn't have been doing it, but what are you gonna do? He basically "monkey-crawled' his way up, this time only a woman offered help, which was an extremely nice thought, but there wasn't much she could do for him. I was really impressed with Matt's climbing moves but I'm just nervous he's way over-doing it. Glad I got that Vicodin RX. One of us is gonna need it by the end of this trip! Our next stop was the beach at the Turtle Bay Resort (the resort Forgetting Sarah Marshall was filmed at), Kuilima Cove. This is described as a great place for beginner snorkelers and they are accurate. It was pretty dull compared to Shark's Cove, so we didn't stay long. This beach is at least like a normal sandy beach, so he only had to deal with walking on sand with crutches- a walk in the park after our last adventure. We were pretty hungry by this point so we decided we'd go for a shrimp truck lunch again. Matt wanted to go back to Giovanni's while I wanted to try Macky's since it gets just as many good reviews as Giovanni's. So we decided on Macky's. It was about a 10 mile drive from Turtle Bay, heading back towards Aulani. The set up is similar, covered tables, sink to wash your hands and the menu is slightly better at Macky's. The price is also lower and you get more food compared to Giovanni's- additional salad & pineapple at Macky's. Our order of shrimp at Giovanni's was slightly over-cooked, but the garlic was in your face good. Where at Macky's the shrimp is cooked perfectly and they butterfly the shrimp for easier peeling and the taste is more well-rounded- more butter flavor than garlic. So if you're a huge fan of garlic, definitely go to Giovanni's. If you prefer a few more options (coconut shrimp, original shrimp, fruit plate) and garlic is not your main reason for living, go to Macky's. After lunch we headed back towards our hotel to visit our final snorkeling spot that is pretty awesome, by reviews, and only less than a mile from Aulani, Kahe Point Beach Park, also known as, Electric Beach. Another beach that was difficult for Gimpy to navigate to, but not near as bad as Shark's Cove. Also, when getting there, the signs are not real clear and all you see are giant cliffs dropping to the water. You have to walk all the way to the right, when facing the water. After a little bit of a walk you'll see the small sandy beach that you can climb down to or if you go more to the right, there's a windy path that's not too bad. This beach is awesome for snorkeling and a lot of people come here to learn how to scuba dive. You need to be a good swimmer though. The best area for snorkeling is probably about, I don't know, 100 feet out and the waves are a pretty good size. I won't get into all the details here, you can read about it on the link above, but the reason this place is so good for snorkeling is because the pipes from the power plant enter the ocean to cool the water inside, so the water temperature is much higher here. Due to the higher water temp, their is tons of fish and you can even find turtles and dolphins. A very cool spot, but like I said, you gotta know your limits. As soon as Matt was in the water I was a nervous wreck. I could barely see him most of the time. Then as I'm sitting there I'm realizing that even if I could see him at all times, if he was struggling, there is nothing I could have done for him. So now I'm trying to talk myself out of panicking and praying like never before. Nice and relaxing day at the beach, right? Ugh. Finally, after what felt like forever I can see Matt headed back for the shore. Thank God!! When he gets back, I immediately tell him what a bad idea that was to which his response is oh, so annoying and oh, so male, "I know...Yeah, there's nothing you could have done for me, but say good-bye.". Thanks, Matt. So after I was done panicking, for one day, we decided to head back to the resort for me to finally get a taste of the pools. On our climb back up, the nicest local saw Matt struggling from the parking lot and rushed down and walked along side Matt in case he couldn't make it. It was really sweet. He walked us practically to the car while talking to us about the "much better (safer)" beaches that we could go to, that weren't so difficult to get to. Yeah, where were you this morning when we were rock-climbing at Shark's Cove? As we drove back to the resort we had our first sight of the horrendous traffic we had heard about. The westbound lanes (the road you'd take to Aulani from, well, anywhere) was a standstill at about 2:30pm. We were so happy we were headed the opposite way and literally, only less than a mile. (You cannot walk to this beach from Aulani.) It looked bad, but it was right at Aulani and past it, so we don't know how far it went, it possibly may not have affected driving to Aulani. Once back at the resort, I headed up to the room with all the stuff and I told Matt I'd meet him at the pool. Once in the room, I dropped the stuff, got Aulani's wheelchair and brought it down to return it and pick up our rented one that arrived this morning. With fire engine red wheelchair in hand I went Gimpy searching. Not as simple as you'd think. I guess the look on my face was a dead give away because one of the people who workers at the pool asked me, "Are you looking for the guy on crutches?". I swear, even the cast members have magical powers. So I explained the whole thing and about how I hadn't even been to the pool yet so I wasn't sure where I was going. So he told me to go get my wrist band and towels and that he would take the wheelchair and find Matt. He was so sweet- Matt says it's because I was in a swim suit. So I got my towels and wrist band (you have to check in and receive a colored wrist band each day to swim in the pool) and then went to the main pool like the guy directed me. There he was with my wheelchair but no Matt. I get to him and he says, "Man, he moves fast for a guy on crutches. I can't find him.". Then just a few moments later, there was Matt. We were expecting him to be in the pool, but he had gotten some seats all the way in the back row. Once I found Gimpy, we headed in the pool. My first moment to enjoy this amazing resort. In researching this trip I read on and on about the water temperature of the pool being so chilly. I have no idea what these people are talking about and I am literally the biggest baby when it come to water temperature. It was like bath water. So nice. So I finally am in the pool at Aulani and what happens, someone did something in the pool and not even 10 minutes after I get in there, they close the pool. Seriously?? So we decided to go in the lazy river, which is just as warm as the pool and really nice. Very Typhoon Lagoon-esk if you ask me. After two trips around I announce that I finally want to try that double-decker, infinity hot tub, that I've seen so many pictures of. So we get out of the lazy river and walk in the cold breeze all the way to the other side of the pool area, where the hot tub is. When we get there we see a "pool closed" sign in front of it. I swear. We feel like we're on that episode of the Brady Bunch when they went to Hawaii and stole that idle or something. So I immediately start grilling Matt to see what he stole and how we can resolve it. Ha! It's now 4:15pm so we just decide to head up to the room a little early and try to make happy hour at MonkeyPod. We decided to walk to MonkeyPod since we had a wheelchair, forgetting about the monstrous hill, that you would only notice if you had an injury, Aulani is perched upon. I of course did not bring athletic shoes, because I was not planning on pushing a wheelchair, so off I went down this steep hill, in my flip flops, using all of my body weight to keep Matt from going flying. It wasn't as hard as I thought it'd be, but I was just a tad nervous of getting him back up that hill. After the hill it was a nice walk over to MonkeyPod where we had another great meal. Well, I didn't really like mine, but that wasn't their fault, I shouldn't have ordered it. We had a great waitress and they had that same band there again. We sat outside with a view of Aulani across the street, surrounded by tiki torches. Really nice. I took a bunch of video. After dinner we headed next door to the ABC Store (like 711) to pick up some Maui Onion Potato Chips for Matt that I have heard so much about. Apparently, they're really good. Then we headed back to the resort. Matt said he'd just crutch himself (did I just make that up?) up the hill, but I wanted to give it a shot. I need to get back into the wheelchair pushing groove and know what I can and can't do, so this was my trial run. I did it. I pushed him up that crazy hill. I could barely stand by the top of the hill but I did it. The positive is, I don't think I'm going to gain very much weight on this trip, so yay me! After we got back we had wanted to spend our last evening in the hot tub, which I have yet to try, but I was just so tired from such a strenuous day and the thought if getting back into a swim suit after I had just showered sounded awful. 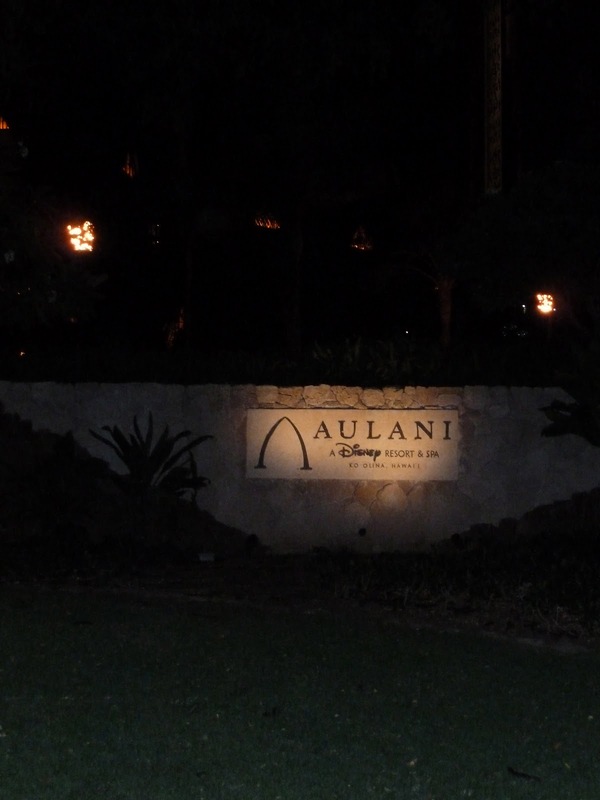 I know I will forever regret that decision, since I never got to enjoy Aulani at night, but I just couldn't do anymore and I would have been miserable the whole time anyway. Matt decided he was going with or without me, so he hobbled himself down there while I just laid in bed, trying to not be too bummed about the situation. Didn't work out too well. I have started to upload all of our pictures to our picture site. The link is at the top. We've been taking a lot of video, so those will have to wait until we're home and one of our underwater cameras is annoying and we have to wait to upload those pics once we get home. Either way, enjoy. wow...what a day! I agree with Matt, after I saw the picture of you in the lazy river, the cast member was DEFINITELY "interested" in helping YOU find Matt!!!! I hope you can get some relaxing time on the cruise or you will need a vacation when you get home to rest! How long do we have to wait for another entry for crying out loud? Matt, you're in Hawaii, you can watch Everybody Loves Raymond when you're back! Day 9- Boarding the ship. Day 7- Snorkeling and Stank. Day 3- Sharks in the water.